Summers in the south can be brutal. With temperatures consistently hitting 90°F and above, a cloudless day with little wind can take its toll on even the most veteran of fisherman. Flies that bite, overheating and sun burn are just some of the major enemies of an anchored boat and its crew. This makes chumming for drum and cobia, the heavy hitters in the bay this time of year, not just unpleasant but flat at dangerous if you’re not taking precautions to keep cool. One way to circumvent these unpleasantries is to beat the heat by fishing at night instead of your traditional morning / daytime hours. Not only does fishing at night help keep you cool and out of the sun, Drum are actually more active feeders at night as they roam the shoals foraging for food on the bottom. Timing an actively rising or lowering tide with a good lunar phase while at night is a strong recipe for success when hunting the shoals for a big (and I mean BIG) Drum. 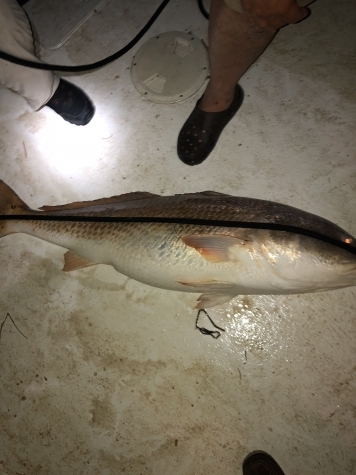 Most of the charter boat captains even like to boast they switch to night trips for these giants starting late spring because of how consistently productive it is. While fishing the bay at night, always remember to keep your anchor lights on and be aware of your surroundings. The water around the shoals can get hairy quick and if you’re not paying attention you can always get into some dicey situations. Often times at night, especially early in the season, there’s a good number of boats fishing the same area and there’s plenty to go around so try to stay within view distance of other vessels in case anything were to happen to either party. There’s always safety in numbers.